The Sunken land shelf of Wainga-roa was obviously a major cultural region of the Uruan civilisation, which began to disappear under the gradual rise of the ocean at the close of the last Ice-Age, at which time this civilisation had reached its peak. New Zealand, finally isolated, continued to lose some of its land surface to the sea, and by 10,000 years ago Stewart Island was cut off from the mainland, and Cook Strait created to form North and South Islands. Maori ‘deluge’ legends of this time are many. In one, Tupu-nui-a-uta [the king of the interior] and the teacher Para-whenua-mea [“debris of the flood”], seeing the coming flood built a large, very wide raft and placed a house upon it, with supplies such as water and pau-shells, food such as fern root and kumara, and dogs. The ‘wall’, or rather what is revealed above ground, is 14m long on an east-west axis. to be the summit of a massive stepped pyramid. Photo © Rex Gilroy 2004. Placing their families on the raft, they also took on board Tiu [“fly like a bird without flapping its wings*”] and Ret [snare], and a female named Wai-puna-hau [“source of the wind”] and many other women besides. [*obviously birdmen and women]. As the flood reached one settlement after another the great raft and its occupants floated freely on the surface and then on down the river Tohinga and into a number of streams. Eventually the raft entered the open sea. Lighting a fire by friction they offered sacrifices to the gods in thanks for their being saved. They sailed on for eight months [or moons] until they sighted land appearing above the waters. This was Hawaiki, and they landed there. These “Great Flood” traditions, handed down by the Uru to later arrivals on these shores, including the Morioris, are similar to others passed on by the Uru to other near-neighbours they came into contact with, including the native peoples of New Guinea and island Melanesia. There can be no doubt that the Uru ruled Wainga-roa and New Zealand for thousands of years, as their ocean-going watercraft were exploring the ancient world. New Zealand had been part of this great Pacific extension of the Australian Uruan civilisation, which some time around 15,000 years ago, had begun spreading eastwards. Their vessels would have crossed the narrow sea created by the Wainga-roa land-shelf, from the Australian East Coast, to establish the megalithic cities and ceremonial sites. In later times with the great submergence having formed the present-day islands, the Uru continued their spread across the Pacific, eventually to reach the shores of Central and South America. Population increases were largely responsible for the Uru colonising expeditions, in the course of which, their large New Zealand population was reduced. Even so, there appears to have been a considerable population of Uru in North and South Island by the time of the first Polynesian arrivals. In their migrations from Australia the Uru carried their written language with them, particularly to the west Pacific islands including New Zealand. 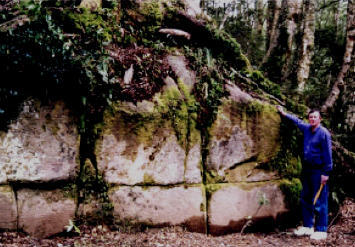 Rocks bearing the script of the Uru occur from southeastern to mainland Asia and throughout the rest of the Old World, and across the Pacific to the Americas. They are also found in profusion at widely scattered sites throughout New Zealand. During our 1997 New Zealand field investigation, Heather and I uncovered Uruan rock inscriptions in the vicinity of a number of altar stones near Mt Maunganui outside Tauranga in North Island’s Bay of Plenty, reputed to have been a massive hill fort of the Patupaiarehe, also known as the Turehu, or “Lords of the Soil”, a red or fair-haired, blue-eyed, white-skinned race which Maori tradition admits, preceded them to these shores. It was this race which introduced the arts of agriculture to these islands, and erected massive megalithic structures throughout the country. The remains of their agricultural activities are still to be seen today wherever they erected their characteristic stepped [pyramid] or rounded [ziggurat] hill forts [later utilised and copied by the Maoris], in the form of irrigation ditches and terracing. They also utilised natural hills, shaping them into four and sometimes three-sided pyramids, as in the case of one 90m tall, flat-topped, four-sided pyramid-hill found in Central South Island. Ancient agricultural terracing for the growing of taro, covers much of the south face of Mt Maunganui, nearby which in 1997 an Uruan rock inscription was found naming it “Mountain of the Sun”. The form of script here is “Late Advanced Uruan”, which places the site around 7,000 years BP. The Uruan Sun-Worship religion is well represented here among the many altars. One elaborate altar measures 93cm tall by 1.2m wide, by 1.92m long with two carved steps leading up to a flat, 1.26m square summit. Nearby, during our 1997 visit, an Uruan stone inscription was found, afterwards translated to read “Land of Lawana”. A second such inscription found in the same area during our 1998 return visit to the site re-inforced my belief that this was the name of an Uruan monarch of old New Zealand.. This massive, 300m tall, four-sided pyramid, located at a northern South Island location, was modified in antiquity from a hill. A flat summit was created for astronomical observations. Photo copyright © Rex Gilroy 2004. Another inscription found upon a nearby stone slab in 1997 translates as ‘Nim’, the name of their Sun-God found across Australia. During our 1997 return visit to the site, we turned up two more Uruan rock inscriptions. One states “Rain brings winter”, the other reads “Mountain of the Sun”, suggesting Mt Maunganui was a ceremonial Sunworship site. I have already mentioned in Chapter Eleven my discovery of a little ‘Birdman’ image at Mt Maunganui The image of the birdman in various forms is found from Mesopotamia to New Guinea and Australia; Central Pacific islands, Easter Island and the Americas. Yet his oldest representations appear only in Australia, implying that the birdman and associated cults were spread beyond Australia by world-travelling Uruans at the dawn of history. principal incentive for colonising voyages to be dispatched further out into the Pacific Ocean. 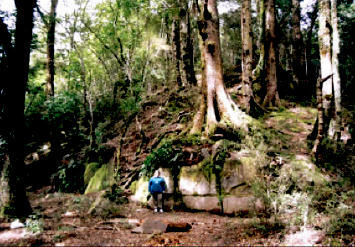 15m or more deep layer of volcanic ash, in what is now the Kaimanawa State Forest outside Lake Taupo.